Bracelet: It settles inside, which prevents it from sliding, and closes above with a covered button. Very comfortable and 100 % cotton, it’s made with fabrics coming from Japan.Made to order: Sizes between 13 et 26 cm / 5 ¼ to 10 ¼ inches depending to the size. (circumference of the wrist). 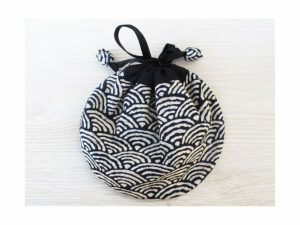 Drawsting purse: Opened, this drawsting bag is flat and has a half moon shape. Closed, it becomes round and gathered with a black ribbon stopped in its extremities with a litle fabric “pearl” shapped as a flower blossom. Japanese fabric 100% cotton. Checkbook case: It measures 4″ wide by 7 1/4″ tall. An Obimaika design flap fastens it with a fabric covered button. 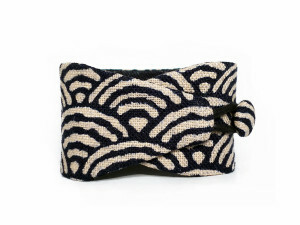 Mini Obi belt: With its slinding system, it can be adjustable to the perimeter of waist or hips. The width is 5 cm (2 inches). An opening allows passing a strap and tying i ton the front or on the side. 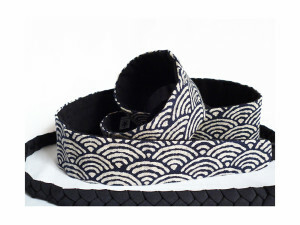 Straps are composed of three braided laces and completed by a small “yoyo” and measure 70 to 120 cm (24 to 47 inches). No visible seams and reversible (black). Sizes available: S to 3XL. Obi belt: Without visible seams, the belt measures 16 cm front (6 ¼ inches), 10 cm on the side (4 inches) and 3 cm at the level of strips (1 ¼ inches) and minimum 100 cm (39 ½ inches)for the straps which cross at the back part through an opening facilitating their perfect super-imposition. It can be tied in different ways: at the front, at the side or at the back. Exclusive models without visible seams and a wide variety of sizes. Flower bag: Japanese design octogonal bag. Laid flat, it measures 58 cm (23 inches) and has 2 handles. Each handle is 60 cm long (24 inches) and 30 cm (12 inches) when worn on the shoulder.